Biography: Zephaniah and Lois minister together in Berachah Apostolic Spiritual Intellectual Society, also known as BASIS, which began in 1994. Since that time, Zephaniah and Lois have planted three churches, equipped thousands of church attendees, and have trained many pastors. 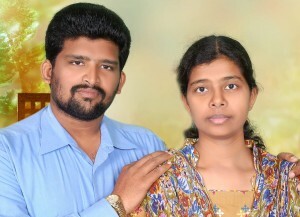 They have begun a mobile Bible college, and have preached the gospel in many major crusades in India. The vision for BASIS is to train pastors and leaders, and start a school and home for the children of the martyred. Their city of Vishakapatnam is a major city in Andhra Pradesh state and has a major RSS office. RSS is the organization of the Hindu religion that has violently attacked Christians in Orissa state. BASIS has cell groups, a children's ministry and a very active youth ministry which holds special meetings every month for college students. The focus of the ministry is on youth, children, prayer, and leadership training. Strengths: Zephaniah moves in words of knowledge, words of wisdom, healing and faith.